Unfortunately, this item is out of stock. But you can read it online. Also, a new and revised edition has been published by the FPMT Education Department and is available through the Foundation Store. Many people ask, What can I do to make my life meaningful? -- especially when facing problems and depression. 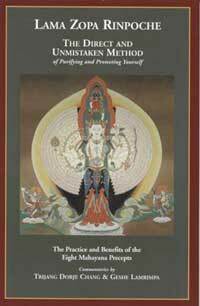 One answer is to take the eight Mahayana precepts. These precepts are a set of eight vows that are taken before dawn in a short, simple ceremony and kept for twenty-four hours. No matter whether you are ordained or lay, once you have received the transmission, you can take the precepts at any time for as long as you choose. These Mahayana precepts enable you to live in the essence of pure moral conduct, and since you take them with the strong motivation of cherishing and wishing to benefit others, their value is immeasurable. Taking these precepts is a powerful and effective way for you to build, maintain and increase deep propensities for spiritual practice and attainment and thus is a profound method for giving meaning to your precious human life. This book is a practical guide. It explains the benefits of the vows and the meaning of the ceremony for receiving them, and for easy reference contains the ceremony itself, written out clearly for regular use.